Hemp has been used for clothing, paper and rope for thousands of years, and is actually one of the oldest domesticated crops known to man. According to Columbia History of the World, the oldest relic of human industry is a piece of hemp fabric dating back to approximately 8,000 BC. What is hemp and why was it ever prohibited? Hemp, also known as industrial hemp, is one of the many different varieties of the cannabis plant and is known for the non-psychoactive (less than 0.3% THC) varieties of cannabis sativa. While marijuana and hemp both come from the same cannabis species, they are genetically distinct and are further distinguished by use, chemical makeup, and cultivation methods. Hemp, known as a renewable source for raw materials that are routinely incorporated into thousands of products. 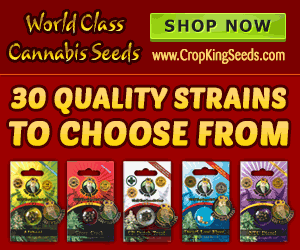 Its seeds and flowers are used in health foods, organic body care, and other nutraceuticals. Clothing, construction materials, paper, biofuel, plastic composites, and more are made with hemp fibers and stalks. The Hemp Industries Association (HIA) estimated the total retail value of all hemp products sold in the U.S. at approximately $620 million and growing. Unfortunately, most of the raw hemp materials are imported from other countries. Hopefully, with many states now legalizing cannabis for medicinal and recreational use, hemp will have a comeback as a primary crop in the US for the many practical uses it has. Hemp is also a great rotation crop for farmers, due to its excessive release of CO2, its detoxification of soil, and prevention of soil erosion. Hemp breaks down well after harvest, providing valuable nutrients to the soil. Lastly, hemp requires no pesticides and much less water to grow, making it even more green as an environmentally friendly crop, much more so than traditional crops. Hemp has an amazing array of benefits, but altering your conscious is not one of them, because hemp contains virtually zero tetrahydrocannabinol (THC). Many have been known to attempt to smoke it to get high, but report that it only that it makes them feel like they have a bad hangover. Going back to 1937, the Marihuana Tax Act was enacted to strictly regulate the cultivation and sale of all cannabis varieties. The Controlled Substances Act of 1970 classified all forms of cannabis, including hemp, as a Schedule I drug, making it illegal to grow it in the United States. That law forced hemp to be imported from other countries, costing the US billions of dollars in revenues over the last 47 years. As a result, most people in the US know little to nothing about the industrial uses of the plant and continue to associate hemp with its cannabis cousin, marijuana. The 2014 US Farm Bill allows states that have passed their own industrial hemp legislation to grow industrial hemp for purposes of research and development. Immediately several states, including Oregon, began conducting hemp pilot projects. Other states are currently considering similar legislation and programs. At last, hemp is making a comeback with American farmers. In January of 2015, the Industrial Hemp Farming Act (H.R. 525 and S. 134) was introduced in the House and Senate. If passed, it would remove all federal restrictions on the cultivation of industrial hemp, and remove its classification as a Schedule I controlled substance. Unfortunately, it is stuck in the political red tape of DC and hemp continues to be classified incorrectly. Imagine, if the federal prohibition of hemp is finally repealed. The US would join the rest of the industrialized nations, in adding the world’s oldest domesticated crop to our list grown here at home. Not to mention the billions of dollars that would stay here in the good ‘ol USA… making America green again! Another amazing use of hemp is creating clean fuel. We’re still a ways away from a hemp-powered car, but industrial hemp has made a number of headlines in past years, especially as an alternative energy source, as people have begun to take a closer look at this affordable alternative. Researchers at UConn have found that industrial hemp has properties that make it viable and even attractive as a raw material, or feedstock, for producing biodiesel – sustainable diesel fuel made from renewable plant sources. The plant’s ability to grow in infertile soils also reduces the need to grow it on primary croplands, which can then be reserved for growing food, says Richard Parnas, a professor of chemical, materials, and biomolecular engineering who led the study. “For sustainable fuels, often it comes down to a question of food versus fuel,” says Parnas, noting that major current biodiesel plants include food crops such as soybeans, olives, peanuts, and rapeseed. “It’s equally important to make fuel from plants that are not food, but also won’t need the high-quality land.” Hemp seeds, which house the plant’s natural oils, are often discarded. Parnas points out that this apparent waste product could be put to good use by turning it into fuel. “If someone is already growing hemp,” he says, “they might be able to produce enough fuel to power their whole farm with the oil from the seeds they produce.” The fact that a hemp industry already exists, he continues, means that a hemp biodiesel industry would need little additional investment. The hemp biodiesel showed a high efficiency of conversion–97 percent of the hemp oil was converted to biodiesel–and it passed all the laboratory’s tests, even showing properties that suggest it could be used at lower temperatures than any biodiesel currently on the market. So, what are some health benefits of hemp for us as individuals? How can we introduce it into our everyday lives and why would we want to? For one, hemp seeds and oils provide all of the amino acids, Omega 3 and 6’s and numerous other necessary nutrients the body needs to function properly. We are able to get the complete recommended daily supply in less than 3 tablespoons of seed, oil or protein powder. On a molecular level, the proteins supplied by hemp detoxify and rid the body of bad cells and replace them with new functioning cells daily. All of that and it’s organic, gluten free and hypoallergenic. Hemp flour, oil, protein powder and seeds are easy to use as substitutions in recipes or added to dishes served on the menu, when dining out. Restaurants using industrial hemp products are able to boast healthy choices and the community benefits all the way down to the cellular level! 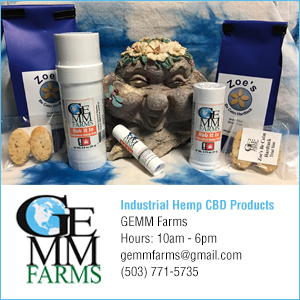 Oregon consumers are known to choose healthier products and services and hemp is right in line to be added to our healthy lifestyles! Not only is it more environmentally smart to use it for clothing, paper, and disposable products, it makes sense to incorporate it into our diets for optimal health and wellness. While many cannabis enthusiasts recognize the benefits and enjoyment of medicinal and recreational cannabis… this may be the year to fully embrace agricultural/industrial cannabis and take the plunge with hemp, making it a household word in your home!